Decaf Vermont Maple Pecan flavored coffee is the perfect balance of maple syrup flavoring with toasted pecans. Offering the full flavor and aroma of our regular coffees, this decaf flavored coffee brews into an exceptional cup without the additional affects of caffeine. If you like pecans, you will find the Vermont maple syrup to complement the nuts exceptionally well, making this 100% Arabica bean coffee mix undeniable in its gentle aroma and full-bodied flavor. Caffeine-free and only 2 calories in each cup, Decaf Vermont Maple Pecan flavored coffee will leave you wanting more without feeling guilty about the wholesomely delicious taste. FlavoredCoffee.com is now offering 1/2lb bags of our decaf flavored coffees, so you can sample multiple flavors to discover your favorites! Packaged in a heat-sealed valve bag, the Decaf Vermont Maple Pecan coffee will be roasted and shipped on the same day. Decaf Vermont Maple flavored coffee is perfect for anyone that loves waffles and pancakes drenched in maple syrup � especially with a toasted topping of pecans. 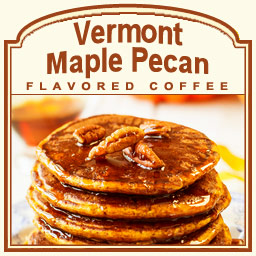 Let the morning smell of maple pecan awaken your senses with the first sip of Decaf Vermont Maple Pecan flavored coffee.